MOSCOW, September 29 -. RIA Novosti Russian President Vladimir Putin signed a decree on the beginning of the autumn conscription. 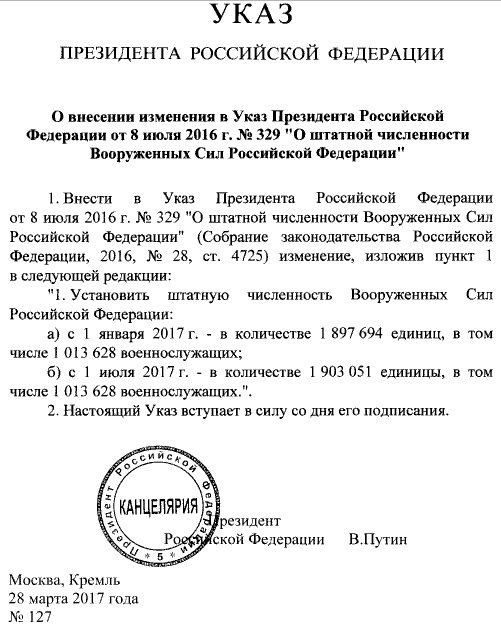 "To carry out from 1 October to 31 December 2016 the conscription of Russian citizens between the ages of 18 to 27 years, not in the reserve and to be ... conscription, in the amount of 152 thousand people," - said in the text of the decree. In the same document, dismissed soldiers, sailors and petty officers, whose term of military service on an appeal has expired. The Government, the executive authorities and the draft commission prescribed to ensure the implementation of measures associated with the call. Spring Call 2016 touched 155 thousand people, autumn call 2015 - 147 thousand people. MOSCOW, September 30 -. RIA Novosti The number of young people who evade conscription, over the past six months has decreased by more than 30%, said the Head of the Main Organization and Mobilization Directorate of the General Staff of the Russian Armed Forces, Colonel-General Vasily Tonkoshkurov. "For six months the number of people who have received the agenda, but arrived in military commissariat on the previous call has decreased by more than 30%", - said Tonkoshkurov. According to him, during the spring call number is not arriving on the agenda in the military based on the amount received is less than half of the agenda percent (0.47%). Also, there is a trend the improvement in shelf life of citizens on health to military service: in the spring of 2016 it amounted to 76% (in the spring of 2015 - 74.4%). At the same time about 64 thousand conscripts were sent to the in-depth survey of medical institutions, said Colonel-General. "In addition, with the autumn conscription increased demands on the health of citizens to be called up for military service", - he stressed Tonkoshkurov. As for delays, he recalled Colonel General, that on July 4, the amendments to the law "On Military Duty and Military Service", which provides for deferral citizens received by the Russian troops of the National Guard after graduation and having special ranks. "At the Ministry of Defence website in the section" at the call of service "recruits and their families will be able to find a questions and answers on the subject of the call, as well as information on the responsibility for draft evasion, including the grounds for a criminal investigation and bringing to administrative responsibility , "- said Tonkoshkurov. MOSCOW, January 25 - RIA Novosti. More than 20 thousand Russian students is expected to attract to the program of military training of soldiers and sergeants Reserve said Wednesday in the State Duma, State Secretary, Deputy Defense Minister Nikolai Pankov. "All types of military training covered 60 thousand students, of which kind of training soldiers and sergeants stock - 20149 students This is as much as we allow our funds demand for such training form we have extremely high competition is high.." - He said, during the hearing of the bill, which is expected to amend the federal law "On military duty and military service." MOSCOW, Mar 7 - RIA Novosti, Mikhail Sevastyanov. Forty-five thousand women serve under contract in the modern Armed Forces of Russia (5.2%). Female servicemen, as they officially call the representatives of the fine part of the personnel in the RF Armed Forces, perform military duty on the posts of soldiers, sailors, sergeants, petty officers, ensigns, midshipmen and officers in all types and branches of the Russian Armed Forces along with men. In the modern Armed Forces of the Russian Federation, according to the Russian military department, there are forty-five thousand women wearing military ranks. At the same time, the number of, say, the women's military presence is increasing every year. So, in 2016, more than 400 Russians entered the military service. Currently, there are more than 150 specialties that are available to women in the Armed Forces of Russia. As specified in the Ministry of Defense, the majority of women servicemen is represented in the communications, clothing, food and medical services, military educational institutions. "In view of your commitment, scrupulousness and thoroughness with which you approach your duties, you are indispensable in the army." Today, in general, we have 326,000 women in the Armed Forces, civilian personnel (NOTE: 281,000) and those wearing shoulder straps (45,000). With men, on the one hand, honorable, on the other - a difficult burden, "- said the Russian Defense Minister Army General Sergei Shoigu, congratulating women in the Moscow Central Academic Theater of the Russian Army on March 6. Separately, he conveyed gratitude to "women, girls, who are at the fighting post today, especially those who are currently working in distant Syria, carrying out huge tasks to provide counter-terrorism operation and to provide assistance to the population, medical care to all who need it." These 45,000 includes ~4,000 officers, ~8,000 warrant officers plus ~32,000 sergeants and contract privates. At the recent GUK assemblage, Fedorov declared there are 730 general and admiral duty posts in the armed forces. Thirty-eight are vacant, but 15 are in the process of being filled. Military to increase by 13,628 and civilians by 4,052. Was expecting something like this and believe it relates to Spetsstroy being dissolved and most functions passed to the Ministry of Defense. Spetsstroy officially known as the Federal Agency for Special Construction has been plagued by inefficiency and corruption. Their mishandling of the Vostochny Spaceport construction was the final straw for Putin and he axed them. They performed much the same functions of the US Corp of Engineers, using civilian workers managed by the military for large government construction jobs. The last figures that I saw suggested they had ~14,000 servicemen (military) and that was 10-15 years ago. Other articles suggest they will operate in 8 divisions or companies. Not sure if that will be based on regional or by function. Ouch, 13,000 less then last year. Suppose it should be expected, 2017 & 2018 are the low points on the demographic curve for 18 year old's. Yup. Still, given the increased number of contract soldiers lately I think they should absorb that number without any issues. MOSCOW, April 1. /TASS/. About 142,000 people will be called up for military service during the spring drafting campaign that began in Russia on Saturday. Its distinctive feature will be a significant reduction in the number of recruits - 10,000 less than usual. Another distinctive feature is that this year conscripts from Crimea who used to serve in the region will be sent for the first time to all regions of Russia. In some regions, the dates for the drafting campaign have been shifted due to weather conditions. According to Yevgeny Burdinsky, Deputy Head of the Russian General Staff's Chief Organization and Mobilization Directorate, "the drafting campaign in the Transbaikal, Kamchatka and Khabarovsk Territories, as well as in the Chukotka Autonomous District and Yakutia, will begin a month later - on May 1." The Russian Defense Ministry reported that direct telephone line on the drafting campaign will begin working in the General Staff’s Chief Organization and Mobilization Directorate on May 16. In the fall of 2016, 152,000 people were called up for military service. Many conscripts traditionally expressed the desire to serve in the airborne troops, special ops units and marine corps. MOSCOW, May 1 - RIA Novosti. Russian President Vladimir Putin signed a law allowing him to conclude a contract for military service with servicemen who received secondary vocational education prior to the call-up. The law establishes the right to conclude a contract for military service entering the military service in the Armed Forces of the Russian Federation, the troops of the National Guard of the Russian Federation, the Ministry for Emergency Situations, the Foreign Intelligence Service and state security agencies for military servicemen undergoing military service on conscription who received secondary vocational education prior to conscription. In addition, a similar right is granted to male citizens who are not in the reserve and who have received secondary vocational education. Currently, in accordance with Russian legislation, only male citizens who are not in reserve and conscripts with higher education can enter military service on a contract without military service. Male citizens who do not stay in reserve, who have secondary vocational education, are not able to conclude contracts for military service in military posts of privates and sergeants, as well as ensigns without military service, and conscripts with secondary vocational education may To enter the military service on contract, having served not less than three months. S.-PETERSBURG, June 28 - RIA Novosti. In the next one or two years, there will be no military servicemen on duty in the navy of the Russian Navy, said the deputy commander-in-chief of the Navy, Viktor Bursuk. "As you already know, today the entire crew of submarines, servicemen on submarines, are contractors, this figure is also high on surface ships - about 76%." I think that this issue will be completely resolved in the next year or two, "he said at the International Military -Small salon. MOSCOW, July 15 (Itar-Tass) - RIA Novosti. The Ministry of Defense of the Russian Federation announced the end of the spring draft of 2017, 142 thousand people went to serve in the Russian army. "In the spring of 2017, 142 thousand people were drafted and sent to the Armed Forces of the Russian Federation, military formations and other troops for conscription," the Russian Defense Ministry said in a statement. The Defense Ministry stressed that this recruiting company was granted a postponement to citizens studying in educational organizations of secondary vocational education for the entire period of study. The corresponding changes in the legislation entered into force on January 1, 2017. It is noted that every fifth conscript had a higher education.They were given a choice: a year of service by draft or two years on contract. The most talented draftees were invited to serve in scientific companies. In this campaign, 356 young people were sent to these companies. Also, 199 people were sent to sports companies, they were added to the Defense Ministry. The military also noted the decline in the number of young people who did not attend military enlistment offices. Currently, their number does not exceed 0.2% of the total number of conscripts. On the basis of military formations and military units of the Eastern Military District this year more than 1.5 thousand students will be trained, including about 1.2 thousand after graduation from the university will receive the first officer rank of lieutenant, the rest will be rank and file sergeants of the reserve. Military specialists are trained in military training centers and military training faculties of the Far Eastern State Transport University (FENU), Far Eastern Federal University, and the Pacific State Medical University. In addition, training is organized at the military departments of the Maritime State University and Komsomolsk-on-Amur State Technical University. In the Far East, students are trained in 20 military registration specialties. In the course of training for students, classes were organized on fire training, with practical shooting from small arms, physical, drill, medical training, the basics of the RCB protection. For the specialists of the railway troops, classes will be held on laying the rail-grinding lattice with the use of a tracker, drilling and piercing the rails with powder charges. Last Sunday in Khabarovsk, about 300 FENU students attending the Military Training Center and the Military Training Faculty were taken to military oath on the basis of the military unit of the railway troops of the Eastern Military District. As reported earlier, this is the equivalent of the USA ROTC program. The number planned for all of Russia is 20,000 for this year. This article represents the Far Eastern Region and offers more details. Russian President Vladimir Putin signed a decree on conscription into the military service in autumn 2017, 134 thousand people. The document was published on Wednesday at official portal legal information. EDIT: In 2016, 152 thousand people went to the autumn draft, in 2015 - 147 thousand people. "According to him, the acquisition of scientific and sports companies will continue. He explained that today there are 12 scientific companies that employ 648 people, as well as four sports companies, where 381 people serve." With the announcement the other day of 134,000 being conscripted in the fall, that brings the 2017 total to 276,000 conscripts (142,000 in the spring). This is 30,000 less then 2016 totals of 152,000 and 154,000 respectively. Out of this total, approximately 30,000 conscripts a year are sent to National Guard (mostly) with a few hundred each going to the FSO (Kremlin Guards) and EMERCON (military units). Last year's total was 275,000 out of 306,000+ total conscripts serving in the Defense forces. Am not sure what factor the demographic crisis of draft-able 18 year old's play into this, as 2017 and 2018 are the low points on this curve with slow increases starting again in 2019. Another factor is contract servicemen, with the planned total by end of 2017 being 425,000. This would represent an increase of 41,000 over the end of 2016 total of 384,000 contract servicemen. The end of the year will reveal how successful this was but overall would not represent much of an increase for the year (~10,000). This does not include the almost 14,000 servicemen that transferred into the Defense forces from the dissolved Spetsstroy (Special Construction). Have seen figures in the past suggesting this force would be 4-6,000 officers and 8-10,000 Warrant Officers, Sergeants and contract servicemen. In accordance with the Decree of the President of the Russian Federation this autumn, 134,000 people are called up for military service. As for the order of its conduct, then there are no fundamental innovations, although there are certain features. First, for the first time in recent years, the number of citizens conscripted for military service has been significantly reduced. This time there are 18 thousand fewer than last fall. This is primarily due to the increase in the Armed Forces of the share of contract servicemen, the number of which has increased by almost 200 thousand people in the past five years alone. [...] Currently, the ratio of the number of contract soldiers to conscripts is 56 to 44 percent. Given the pace and timing of the rearmament of the army and navy (and today the acquisition process is synchronized with the supply of modern weapons and military equipment, as well as with the construction of infrastructure facilities), it is planned to continue increasing the number of contract servicemen until 2021. At the same time, the need for conscripts will decrease by no less than 30 percent . However, we do not plan to completely refuse military service on conscription. Proceeding from the declared ratio. At the moment, 294,000 conscript servicemen are serving in the army ( 152,000 - II-2016, 142,000 - I-2017). Accordingly, the contracted forces in the RF Armed Forces are now about 374,000. Meanwhile, in May of this year Shoigu said that "the number of contractors in the Russian army has increased to 384 thousand people." In December 2016, he called the same figure: 384,000 people. Probably the matter is that in December 2015 Shoigu showed Putin exactly this figure for the plan for 2016: 384 000. Perhaps that's why she wanders from the speech in the performance, not overlapping with the true state of affairs. I would also recall that in February 2014, it was announced that it intended to have 425,000 contractors by January 1, 2017. It seems that at some stage this plan, as unreal, was silently thrown into the basket. In 2017, a target benchmark was set-405,000 military posts to be replaced by contract servicemen. I heard they want to increase ages of contract and conscript forces. Because now life expectancy increases and plus there are a lot of guys in their 30's interested in serving now too. Woman being introduced into more military rolls like pilots and even intelligence helps move men to other places too. Essentially, once they move to full contract armed forces, there will be growth in people interested in serving. Decent wages, taken care of and the growth of patriotism is a thing too. 2007 - 19 500 people. The Ministry of Defense website mentions there being 38 of these (not listed individually), but this may not include branches. Last year there were graduates from 46 institutes of which it was mentioned that for one (IT), it was the first class graduated and for another Institute (actually a branch of), it was the last class scheduled to graduate. So that would indicate a total of 45. Commissioned officers courses run 4-5 years. Warrant officers courses run 2 years, 10 months. Sergeant courses run 10 months.